Did you know that Southern Front Doors was an exhibitor at the last Cy-Fair Home and Garden Show? I hope we didn’t miss you because we had a great time meeting new clients and seeing the familiar faces of some of our existing clients. While enjoying the show, we learn many Reasons Why Homeowners Should Attend Home and Gardens Shows and wanted to give you this information so you can catch us at the next one. One Stop Shop. This tradeshow generally caters to the niche of home improvement and gardening. This show not only give ideas, tips, and advice on how to upgrade your home, it also offers consumers direct access to the products and services of companies within the industry. Money Saver. Usually, when a consumer attends a home show, they are tempted to buy a product or purchase someone’s service. So, vendors typically offer significant discounts and extremely affordable prices to the attendees. It’s a win-win situation for everyone. Real Life Comparison. Hundreds of different vendors participate in the tradeshow essentially to find new customers. This fact is your chance to find out what everyone offers and what they charge to choose the best company for your home improvement projects. DIY Counseling. We understand that this is the age of Do-It-Yourself (DIY) Projects. However, people need guidance to help them properly execute their genius plan. The Home and Garden Show offers workshops and exhibits to inform the attendees of the new trends of the industry and how to address specific home improvement and gardening problems. It’s a Party. Above learning and buying, there are industry related games and activities for every family member. Also, there are usually food and drink tastings, live music, food trucks and various attractions such as a butterfly house. Each show is unique and wants the attendees to enjoy the show and all of its features. 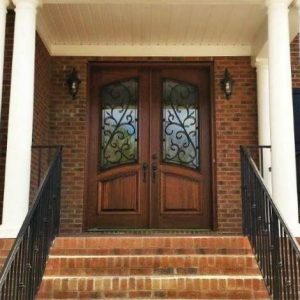 Southern Front Doors enjoy meeting new clients and catching up with the existing clients at the various Home and Garden Shows, and we plan to attend many more in the future. Contact us today and find out if we are an exhibitor at the next upcoming Home and Garden Show. For more information about our company and its services, contact us at 281.890.5860 or visit our website here.